From left, David Beturne, Danielle Letourneau-Therrien, and Renée Moss. So the memories of her time spent with Lisa, who spent five years as her ‘big,’ are scattered, somewhat selective, and certainly not as complete as she would like. She admits, with some embarrassment in her voice, that she knows she and Lisa went to one of the organized events staged by Big Brothers Big Sisters of Franklin County years ago, but couldn’t say exactly when, where, or even what it was. What she clearly remembers, though, and always will, are the dinners she shared at the home of Lisa and her husband, and the air of stability that warmed the room, something decidedly missing from her own home, where alcoholism was taking a heavy toll on day-to-day life. What she remembers also is at some point making a kind of pledge — that one day she would seek to bring that same sense of stability to a young girl who lacked it in her life. That day came a few months ago, not long after Smith-LeClaire and her husband, Anthony, purchased a home in Millers Falls. Angela Smith-LeClaire fulfilled a promise she made to herself years ago by becoming a big sister to Abby. Today, following a lengthy matching process, she is the ‘big’ for Abby, whose family life has been scarred by drug addiction. And one of the things they share is dinner in Angela’s home. They’ve also gone bowling, made Christmas cookies and tree ornaments, cooked a Thanksgiving turkey, and gone on lengthy walks with Angela’s dog, Cooper. And only three months into this relationship, she feels comfortable saying that it is more — in every sense of that word — than she imagined it could be all those years ago. Scott Howard, seen here with Noel, or ‘Macho,’ as his friends call him, wonders why he waited so long to become a big brother. Now serving as associate dean of students at Amherst College, Howard was in another job and another life situation years ago, when he first started thinking about becoming a ‘big.’ He decided that he should wait until a time when he could better handle what he thought would be a huge time commitment. 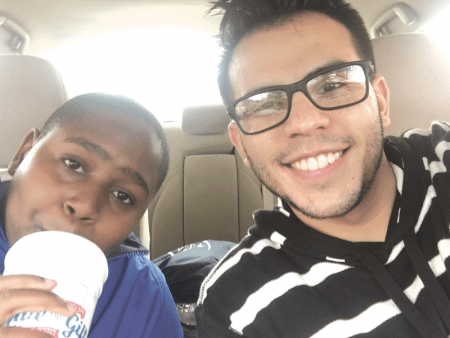 Like Howard, Brian Ortiz said he’s long thought of becoming a big brother, and the time became right this past fall, soon after he became residence director at Magna Hall at American International College. 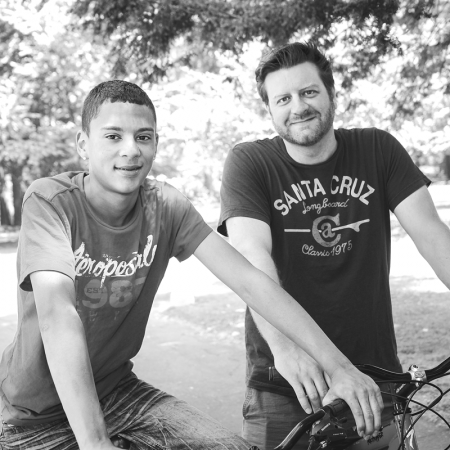 The tireless work of generating these kinds of matches is what BBBS has been all about since 1904. It is an assignment replete with a host of challenges, from the increasingly daunting task of finding young men willing to be ‘bigs’ to raising the money needed to make and administer the matches. Brian Ortiz says there are many rewards that come with being a role model for Desmond. The three area chapters have responded to those challenges with creativity and determination, and the fruits of their efforts can be seen in the photos that accompany this story. They depict bigs and littles sharing time and enriching one another’s lives. And as you read how the three chapters make it all happen, it will become clear why they were chosen as Difference Makers for 2016. But in a way, all those involved with this nonprofit are making a difference — from the corporations and schools that support the organization to the local offices that create the matches; from the mentors who provide stability to those being mentored, who provide their ‘big’ with friendship and so much more. 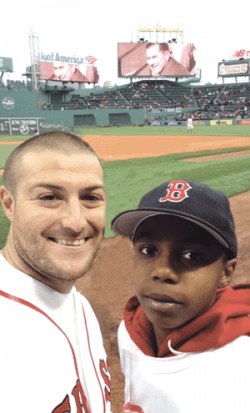 In many ways, Howard’s story represents about the best kind of PR that BBBS could ever hope for. Indeed, he is a young male professional, the type of individual that this organization has struggled to recruit in adequate numbers since day one; recruiting women is also a challenge, but less so than men. Also, he throws a large bucket of cold water on the argument that young people don’t have time to be a mentor — for whatever reason — or often need to wait until a better, more stable time in their lives to take part. And the story just keeps getting better from a PR perspective. Indeed, it drives home the point that poverty and struggling families are harsh realities in every community, even one named Paradise City, which both Howard and Macho call home. “He and I live half a mile from each other, but it’s like our worlds couldn’t be more different,” Howard explained, adding that this experience opened his eyes to that other world as much as it has opened Macho’s — and both individuals are wiser and better for it. 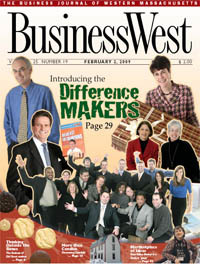 But convincing more people like Howard to become ‘bigs,’ and persuading all young professionals that they’re not too busy to change a child’s life, are only a few of the myriad challenges that BBBS chapters around the world — and in the 413 area code, for that matter — face as they attempt to secure proper matches. 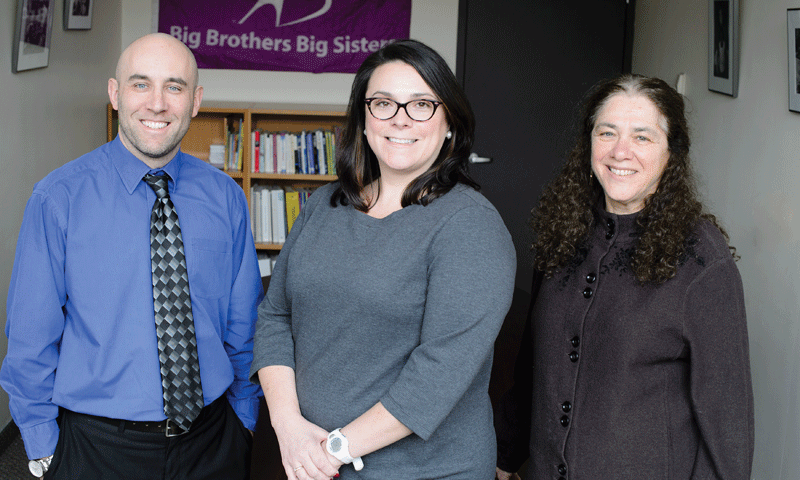 Big Brothers Big Sisters has been making fulfilling matches since 1904. In rural Franklin County, statistically the most impoverished county in the Commonwealth, for example, basic transportation is an issue, said Danielle Letourneau-Therrien, executive director of that office, noting that, once outside Greenfield, mass transit is hit or miss at best. Meanwhile, reliable Internet service, something most now take for granted in Greater Springfield, is a foreign concept in places like Rowe, Heath, Charlemont, and Ashfield, a fact of life that often makes it difficult to communicate with ‘bigs’ and ‘littles’ alike. These two factors, among others, makes the process of enrolling families and creating matches more time-consuming and more complicated, because BBBS has to go to those families, instead of the families going to BBBS. Meanwhile in Hampshire County, as mentioned earlier, it’s often a challenge simply to convince young professionals that there is a need for big brothers and big sisters on that side of the ‘Tofu Curtain,’ a region known for its colleges, arts, restaurants, and trendy downtowns, but where poverty and troubled young people can certainly be found, and without looking very hard. “One of my challenges is making sure people understand what life feels like for those in our community who are living with a lot of invisibility,” Renee Moss, director of CHD/Big Brothers Big Sisters of Hampshire County, explained. “A lot of families and kids are marginalized in their own communities — they’re isolated and very invisible. The reality is that places like Amherst and Northampton have these apartment complexes on the periphery of Main Street and what appear to visitors to be these hip, trendy downtowns. And in Hampden County, well, the overwhelming issue has been, and always will be, need and meeting it, said David Beturne, executive director of that office, adding that it handles two of the state’s most impoverished cities — Springfield and Holyoke — as well as two of its wealthier communities, Longmeadow and Wilbraham, and the need for ‘bigs’ exists at both ends of the spectrum. That’s because the issues that create need for big brothers and big sisters, including everything from incarceration to opioid abuse; from bullying to alcoholism, don’t discriminate along family-income levels, he told BusinessWest. And his county, like the others, is dealing with the loss of some major employers over the past few decades, as well as an ongoing spate of mergers and acquisitions that have left fewer businesses in the hands of local ownership that lives in the communities being served by BBBS. Thus, need has always exceeded not only the supply of ‘bigs’ in the pipeline, but the ability to simply make more matches because of budget and, therefore, staffing constraints. “I can’t match any more kids than I’m currently matching at the pace I am, because my staff would kill me right now,” Beturne said, noting that, even if he could find an adequate number of willing ‘bigs,’ he simply doesn’t have the infrastructure to coordinate matches. Meeting need and overcoming this large assortment of challenges requires persistence, imagination, and relationship-building skills — in equal quantities. And because they’ve been able to display those qualities on a consistent basis, and literally change lives in the process, the three chapters can definitely be considered Difference Makers. The persistence is required because the need never stops. It is, as all three directors indicated, a constant, because there will always be young people who lack stability and a role model in their lives. And imagination is necessary for that same reason, but also because need doesn’t come in one flavor — and, as Bertune said, BBBS isn’t focused on simply making matches; it’s dedicated to making matches that work. As for relationship building, it goes hand-in-hand with the first two components in the equation and goes a long way toward explaining how that mission is accomplished. Examples of imaginative response and relationship building can be found with each area office. In Hampshire County, for example, there is an initiative that matches young people who have been adopted with students at UMass Amherst who were adopted, the only such program of its kind in the country, said Moss, adding that it was conceptualized out of both need and a valuable resource at UMass — the Rudd Adoption Research Program, which is affiliated with the Center for Research on Families. 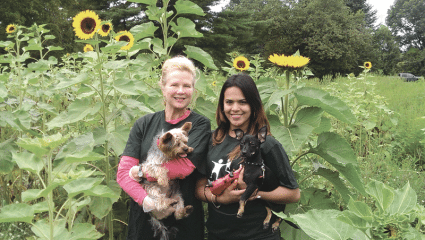 The initiative is simply one example of how the Hampshire County BBBS works to tap what is easily that region’s best asset, its colleges — specifically, in this case, UMass, Amherst College, and Smith College. “We don’t really have a corporate base, so probably 50% of our mentors are college students,” Moss explained, adding that some take part in the traditional community-based model of service, while others are involved in site-based programs on the campuses. 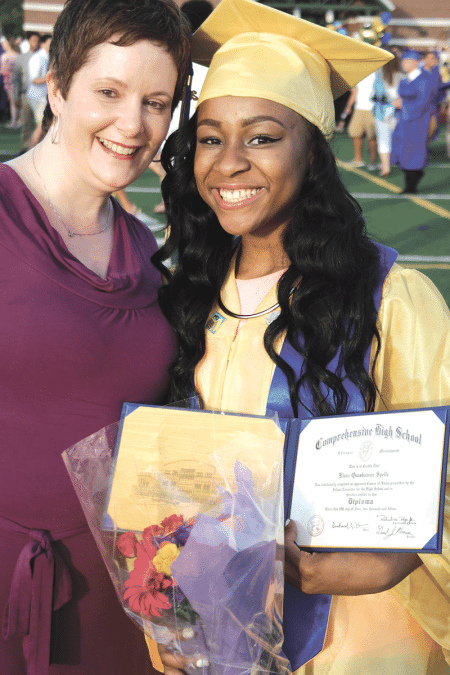 “In Hampshire County, a lot of our ‘littles’ come from families where no one has ever graduated from high school, let alone gone on to college, and they’re growing up in the shadows of higher ed,” she explained. “So, once a week, the school bus drops them off on the campus, where they meet their big brother or big sister, use the facilities on campus — the basketball court or the pool, for example — and then they’ll get together as a group and have dinner in the dining halls. Similarly, the Franklin County chapter has tapped into its respected private schools, Deerfield Academy and Northfield Mount Herman School in Gill, for mentors, said Letourneau-Therrien. A modified but still strenuous screening procedure is used in the matchmaking process, she said, noting that these students, roughly halfway through their junior years when the matches start, are still teenagers for the most part. The ‘bigs’ and ‘littles’ meet on Friday nights, use the facilities at the school, and eat in the dining commons, she explained, adding that the institutions have been involved for many years, and the ratio of men to women who take part is far better than that in the so-called real world. And in Hampden County, that office has met that aforementioned enormous need through a host of partnerships, with large corporations like MassMutual and colleges such as Bay Path University. But even with those more traditional relationships, there are unique twists. Big Brothers Big Sisters has been changing lives for all those involved in their programs. Indeed, MassMutual’s program, called Pathways, which involves employees across a host of departments mentoring students from Putnam and Sci Tech high schools, has its own spinoff. The fruits of all this persistence, imagination, and relationship building are the matches themselves, which are the real story at BBBS and the most visible manner in which it is making a difference. And our three stories are perfect examples. Macho is one of those young people from Florence Heights who hadn’t seen downtown Northampton — until he became matched with Scott Howard. And making that introduction, if you will, is only one of the ways Howard says he’s been able to broaden the horizons of his mentee and take him well beyond his historic but impoverished neighborhood — literally and figuratively. As he listed them, he started with hiking and mountain climbing, two of his passions, as was explained to Macho by those who made the match between the two. Their first official time out together was spent on the Mount Sugarloaf access road in South Deerfield, which was an eye-opening experience for Macho, to say the least. Generating new life experiences, for both the ‘big’ and ‘little,’ is just part of what the program is all about. There’s also that stability factor that Smith-LeClaire mentioned, as well as that role-modeling work that Ortiz described. Indeed, while Ortiz has taken Desmond to Interskate 91 and to see Goosebumps, and plans to take him to see The Force Awakens — he needs to see the first six Star Wars movies himself first so he can understand what’s going on — he’s also taken him to the art museum and the library, and lent a hand with homework. And while that constitutes a learning experience for Desmond, it’s the same for Ortiz, who said he’s learned a lot about himself and the fine art of giving back through this process. In the meantime, he’s doing a lot of the things he didn’t get to do as a kid. Elaborating, she said that Abby’s mother’s wish is that this experience with BBBS helps her child “act like a kid,” said Smith-LeClaire, adding that she sees a lot of herself in her mentee and can associate with every experience and emotion she’s witnessed. “In a lot of ways, I can relate to Abby because I grew up with an alcoholic parent and a really unstable environment,” she noted. “I know what her personality is like, and I want her to be able to have fun with me, but also feel close enough to me to talk about things I can relate to and have a different perspective on than other people. Continuing his unofficial role as BBBS pitchperson, Howard said that, if the program were to “somehow evaporate tomorrow,” he and Macho would still be good friends and still hiking on Mount Sugarloaf together. Perhaps there’s no better testimony to the power of these matches and what they bring to both parties involved. As Howard said, it’s not about service, it’s about making a friend — one who would be standing next to him the day he got married. It’s also about bringing stability into lives where that precious commodity is in short supply — as Lisa brought to Ashley, and Ashley now brings to Abby 20 years later — and about opening eyes and experiencing different worlds. That’s why all those involved with making matches like those described here are true Difference Makers.